Atlanta's oldest neighborhood, Inman Park, maintains its popularity due to a combination of defining features..... Period architecture, a range of dining options to satisfy any culinary palate, accessibility to tree filled parks & paths, and the small town charm of streetside shopping. What I have noticed recently is that Inman Park is your Ice Cream destination! There are seven, YES 7 scoop shops in like a mile of each other. Check out this ice cream tour..... For me, each one offers hard to turn down delicacies, but Queen of Cream is my favorite! Queen of Cream | My photo above of co-founder Cora Cotrim + written previously about here. 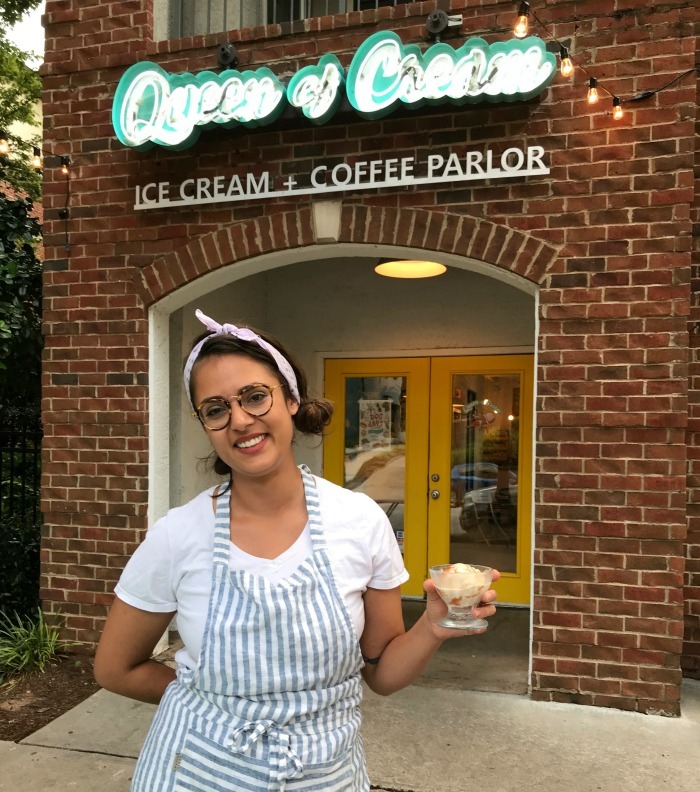 Queen of Cream is the only ice cream parlor of this list that can boast that all of their flavors are made in house and on site. I love that they maintain a couple of fan favorite flavors on their menu but rotate in new monthly creations crafted from seasonal ingredients. Hands down, my go-to is Queen of Cream's Black Pearl -- vegan charcoal ice cream. Also, when you go, their ice cream sandwiches and chocolate chip cookies are mouth watering! Jeni's Ice Cream | Located inside Krog Street Market, Jeni's sets the bar high for exceptional ice cream. I have a couple of favorites, but if you're looking for a dairy alternative without sacrificing taste, Jeni's Dark Chocolate Truffle made from coconut cream is decadent! King of Pops | Yes, not technically ice cream, but an always satisfying cold treat! Step off the BeltLine at Elizabeth Street and step up to King of Pop's order window. Ben & Jerry's | Open as of today and arguably can be credited with pushing standard flavors into a new level of deliciousness, with a healthy dose of humor mixed throughout. Voga Italian Gelato | Nestled within Inman Quarter and offering a denser alternative to traditional ice cream. Jake's Ice Cream | I'm dating myself, but I remember when Jake's first opened on Highland, at the intersection across from Highland Bakery. Jake's Ice Cream was ahead of its time in this city! Flavors are known for their catchy names with unexpected ingredients. Butter & Cream | A longtime Decatur fixture, with an additional location in Roswell and a recently opened 3rd scoop shop near Studioplex with access to the BeltLine, Butter & Cream crafts their ice cream in small batches and offers classic flavors in a style reminiscent of old fashioned ice cream parlors.